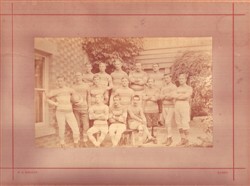 Olney RFC, black and white team photo, 15 players in three rows, with captain(?) holding ball. No players names or date given (see item 042 for details).. Photo is on a mount of pink card with a red line frame. ‘W E Wright, Olney’ is printed below the red border. Photograph by W E Wright, Olney.